Turkish security forces carrying out inspections in several provinces have detained a total of 279 migrants, officials said Thursday. 126 refugees, including Afghan, Pakistani, Palestinian, Iraqi, Iranian, Syrian and Paraguayan nationals, were captured in northwestern Edirne province, a security official, who asked not to be named due to restrictions on talking to the media, told Anadolu Agency. Two others, who are believed to be human traffickers, were also taken in custody, the official said. In northwestern Kırklareli province, gendarmerie forces detected two groups preparing to illegally cross the border to Europe, in Demirköy and Kofcaz districts of the province. 44 migrants and refugees from Afghanistan, Iran and Syria were rounded up as they were trying to illegally cross the border, another security official said. In southwestern Muğla province, coast guards captured 109 refugees, including women and children, who were trying to reach the Greek Island of Kos. 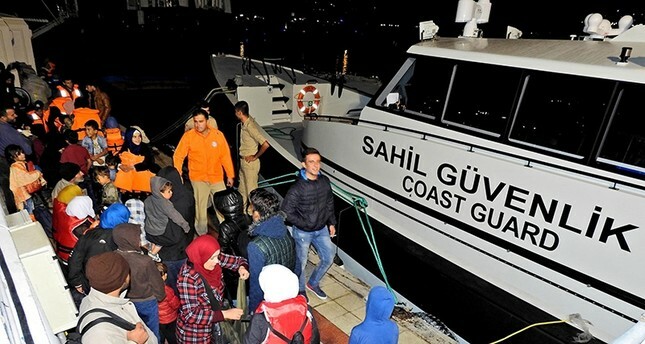 In a separate operation in western Izmir province, 66 migrants were detained near Boğaz Island as they were trying to reach Greek islands illegally. In March 2016, Turkey and the EU signed a deal which aimed to discourage irregular migration through the Aegean Sea by taking stricter measures against human traffickers and improving the conditions of some 3 million Syrian refugees in Turkey. Since then, the number of refugees detained crossing the Aegean Sea between Turkey and Greece has fallen 85 percent, according to the Turkish Coast Guard. Nearly 2,000 people are believed to have drowned trying to cross the Mediterranean in 2017 according to the U.N.